The Tuininga Family Adventures: Uganda Elections Coming: Prayers Appreciated! 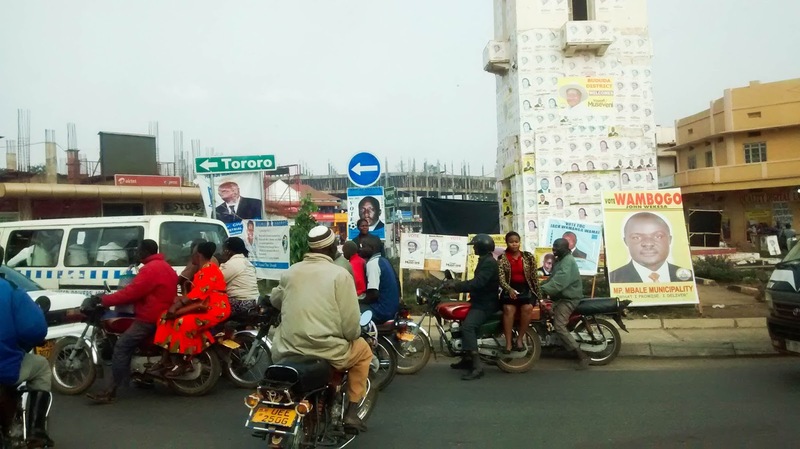 Downtown Mbale is pasted on almost every available surface with political posters. It is a daily reminder that national elections are right around the corner. On February 18th Ugandans will vote for the next president and other local elections will take place in the days following. We are praying for peace during this time! Police and military servicemen are seen now everywhere. Police trucks, army trucks and riot equipment have been rolling through town. Day and night we hear the noise of the civilian force being trained to help the police "maintain security" being pulled through a boot camp like training at our neighboring elementary school. News reports from across Uganda tell about opposition troubles and riots. We are hearing and seeing all the energy that is gathering daily and hoping and praying that it is not used inappropriately. So please pray for the country! Please pray for peace to reign! Please pray for our safety and the safety of our loved ones here!